First, cut strips of your fabric with the pinking shears. You could actually just use scissors, I just like the edge created by pinking shears. And it's not going to fray as much although, fraying wouldn't necessarily be a bad thing here! Mix some fine glitter with the decoupage. Brush the glittered decoupage onto the fabric. I only did it on one side but you could do both if you'd like. Let your strips dry. I used clothespins to clip mine to a plant so they'd dry quickly. And now you have a shimmery fabric! Tie each strip into a knot onto the yarn. 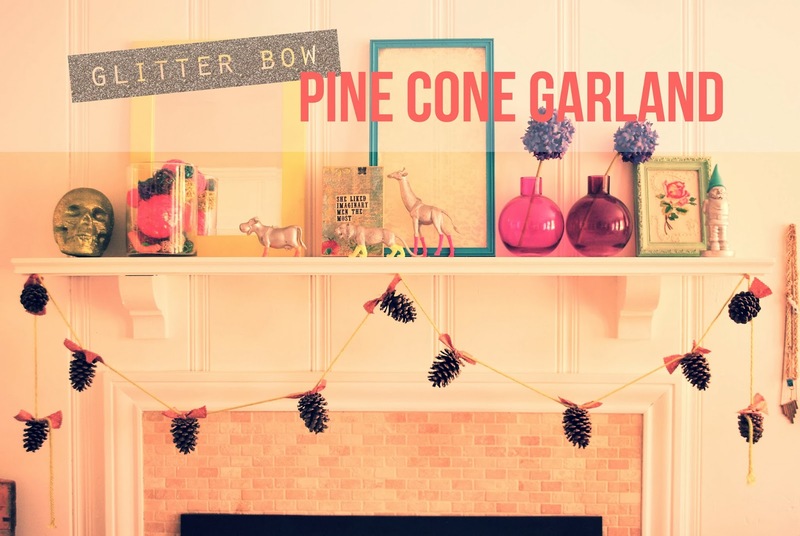 Hot glue each bow onto a pine cone. Then hang that baby up! This project is super super simple but it's so precious! Now, we need to work on the top of our fireplace. It's not really giving a holiday vibe. So cute I wonder if you could use it on the pine cones and glitter then too! How cute! I love pinecones, so fresh and wintery. This garland is beautiful!